Over Easter we embarked on a road trip to southern New South Wales to pick up the camper trailer we purchased online. We left on Thursday afternoon and drove 6 hours to Orbost. Finding suitable Orbost accommodation wasn’t that much of a struggle. The drive to pick up the camper trailer all up would have been nearly 10 hours so we thought we would break it up a bit for the kids as we had to drive back to Cape Conran about 30 mins from Orbost to spend Easter with friends. I did a bit of research and found a couple of motels that would suit our budget for the night. I found the Orbost Motel and from the photo gallery it looked to be newly renovated and perfectly located on the highway (not that it helped us upon arrival as we didn’t look it up and went into Orbost looking for it). Even though it is located on the highway we did not hear any traffic from the road which was great. We arrived late at 10pm and pretty much checked in and went straight to bed. I was surprised upon arrival that the photo gallery was exactly how it looked. It was a comfortable, clean and modern room with 2 queen size beds. The kids are still small so were all able to share one bed. Craig was supposed to put one of the stretchers and sleeping bags in easy reach but he forgot and packed them all so we had to make do. I would have liked one of the kids on the stretcher but considering we were there for less than 8 hours it didn’t really matter anyway. Mini bar, sleek and modern. The bathrooms were clean with products supplied for showering. The shower had a rustic look with slate flooring, very clean with hot showers. The kids commented on how soft and fluffy the towels were. The rooms were finished with corrugated iron and gave a very Australian industrial finish. I thought the design to be very innovative, stylish and welcoming. Modern and stylish bathrooms with soft, fluffy towels. It’s the small things that matter, like the towels and doona covers. Nothing puts me off quicker than dated bedspreads. 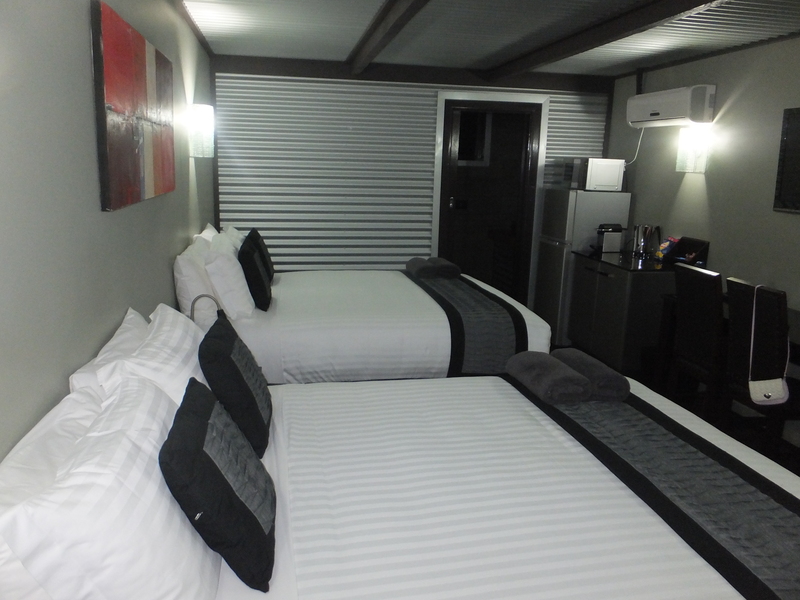 The other motel in Orbost had bed spreads in their photo gallery and this place did not so it won me over very quickly. The beds had beside tables with lamps on with as well which meant I could put the kids to bed and wind down while doing a little social media posting. The wall paintings were tasteful as well which makes a big difference. Bedside tables on both sides and warm coloured paintings. We were up early so we could hit the road before the Easter crowd. Our room had coffee machine with a few pods which was great as the coffee machine produced a fairly decent coffee Craig tells me. I on the other hand drink tea and the motel managers had provided fresh milk in a jug the night before. Again its the small things that make it comfortable and stand out against the others. Laura and husband are extremely easy to deal with, they waited up for our arrival as I had called earlier and advised an approximate ETA. We paid $165AUD for the night and that was a twin queen room. I thought this is a really good price for 5 people. This motel was only $5 more than its competitor, no surprise when I arrived to find them fully booked on this night. I would definitely stay there again and if heading to the south NSW coast in the future I would break up the trip and stay there as its much easier than driving for 10+hours and no doubt safer. If you are looking for a lovely clean, modern, stylish and affordable place to stay, this is the place for you. Phillip Island is on the same side of the bay so if you have any spare time make sure you head over for the penguin parade. Or swing through the Yarra Valley for a segway tour and then pick up a few of our finest wines to drink on your trip. Looks lovely Sally….. It’s always a relief to check into somewhere nice at that time of night! Yes it certainly is and helps that the beds were real comfy so the kids went straight to sleep! We were up at sparrow’s again and the kids were amazing, all up it was 16hrs driving out of 24hrs period!